Altered access points, roundabouts and raised medians can significantly degrade the fair market value of convenience retail property. With a unique and extensive background in downstream petroleum industry retail site operations, transportation engineering, real estate economics, and property valuation, C-Store Valuations has assembled a panel of the nation's foremost experts on access-related issues and the economic impact on the fair market value of the tangible and intangible assets of convenience retail establishments when these types of changes occur. Please see the following pages for the professional biographies of Steve Crooks, Paul Sander and Robert Bainbridge. Put our exceptional qualifications and experience to work for you. Appraisal reports are prepared to International Valuation Standards and the Uniform Standards of Professional Appraisal Practice. Valuations of the total assets of the business (TAB) including tangible assets, realty; tangible assets, non-realty; and intangible assets. Our exclusive automated valuation software speeds the analysis and reduces the time required to produce appraisals. Valuation products can be tailored to your time-frame and budget with desk-top, drive-by, or full, on-site inspection applications. Whether you need independent, third-party valuations or appraisal report reviews of one location or 5,000 locations, C-Store Valuations is the only call you need to make. Please call 541.823.0029, or e-mail us at mailto:reb@cstorevalue.com/. 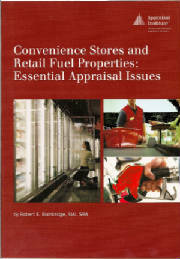 We authored the valuation industry's foremost textbook on the appraisal of convenience stores and gas stations, Convenience Stores and Retail Fuel Properties: Essential Appraisal Issues. This textbook is used by appraisers and valuers throughout the world and is the standard textbook in the valuation seminars taught by the Appraisal Institute. You may order a copy by going to the "OUR BOOK" page on this website. Please click here to go to the OUR BOOK page. Current media comments about the state of commercial real estate markets calls for a careful review of our concepts of prices and market value. We caution commercial property lenders not to under-value their loan portfolios, especially as these issues affect retail property. In spite of the downturn in prices during 2009, commercial property values have sustained an average 4% annual increase since 1999. That's a 44% net gain in value. Please click the link below to download a PDF addressing this topic. You may wish to read a similar view just published in the RICS Fall, 2009 edition of Property World in the article, "Toward Sustainable Finance: The Trouble with Asset Values", written by Dennis Webb, FRICS, MAI, ASA. C-Store Valuations accepts partnerships and working alliances with appraisal and valuation consultants requiring expertise in the area of petrol station valuation. We provide a variety of service levels to meet the diverse needs of valuers with traditonal and non-traditional assignments. We are pleased to have partnered with Jarvala Real Estate Appraisals Ltd. to provide valuation advisory services for retail petroleum-related property in the Province of Ontario. Estimates of market value were made using our PetroMARK® software, which we adapted for use utilizing Canadian operating metrics as published by the Canadian Convenience Store Association, Canada’s largest convenience retail trade association. Please click the VALUATION AND APPRAISALS link below to learn more. Our nation-wide litigation support services include both independent, third-party valuations and advocacy services. We have provided litigation support to property owners, attorneys and transportation departments involved in disputes concerning real property and intangible asset values for gas stations and convenience stores. We maintain one of the world's most comprehensive reference collections of published literature, including trade journal articles, academic studies, monographs, and books, on the appraisal and valuation of convenience stores and gas stations; a single repository of the most-cited valuation literature in the world. NEW! Please see the January/February, 2010 issue of Right of Way magazine published by the International Right of Way Association for our new article, "Retail Gas Properties and the Economics of Access" for current takings issues related to convenience retail properties. To access this article, please click the link below and go to the International Right of Way Association website. NEW! Mr. Bainbridge was a featured speaker at the American Law Institute | American Bar Association, 27th Annual "Eminent Domain and Land Value Litigation" conference in Scottsdale, Arizona held February 4 - 6, 2010. Mr. Bainbridge spoke on the topic, "When Access and Use are Inextricably Tied: The Case for Greater Compensation for Convenience Outlets That Suffer Access Impairment". You may download a collection of related readings cited in this presentation at our Speaking Schedule page. For assistance in assessing the strengths and weaknesses of your situation, just call 541.823.0029, or e-mail us at reb@cstorevalue.com. This initial consultation is usually free-of-charge. Please click the link below for more information on ATTORNEY AND LITIGATION SUPPORT. Please Click Here to go to the International Right of Way Association Website. Please Click Here to go to the 2010 ALI | ABA Eminent Domain Conference Web Page. We have provided custom educational and training courses and workshops for the Appraisal Institute and Royal Dutch Shell Group with national and global venues. Our unique area of expertise is in teaching valuation and geo-economic concepts related to convenience retail property. Educational formats include live classroom presentations and multi-media, on-line programs. Our Whitepapers are some of the most in-depth in the industry and illustrate a few of the clinical valuation research projects conducted by our firm which provide better understanding of how retail convenience markets function and how property value is created. The results of these property market investigations aid in teaching theory and practical valuation applications in the classroom. Mr. Bainbridge is a certified instructor of the International Distance Education Certification Center. Put our in-depth experience to work for you. If you need a custom real estate-related seminar or training workshop for a work group, department or company-wide, let us help you design, execute and deliver a quality, world-class educational program. Just call 541.823.0029, or e-mail us at reb@cstorevalue.com. Please click the link below to learn more about EDUCATION AND TRAINING. To request additional information, you may submit the form below. © COPYRIGHT 2004-2012 ROBERT E. BAINBRIDGE. ALL RIGHTS RESERVED.